The new album is now complete. The band are now seeking a label to work with for the release; news updates will be posted here as available. We are pleased to announce new drummer, Allan “McDibet” MacDonald (ex-Cerebral Bore). We’ve been rehearsing with Allan on material for the new album. Writing is complete for the new album and this track gives a taste of the band’s new direction following a chaotic period of rebirth; thoroughly relentless, but still recognisably Achren. In other news, long time bassist John has left Achren for pastures new. Callum will be taking up the bass duties on the new recordings and the band aim to return to the live scene in 2015. 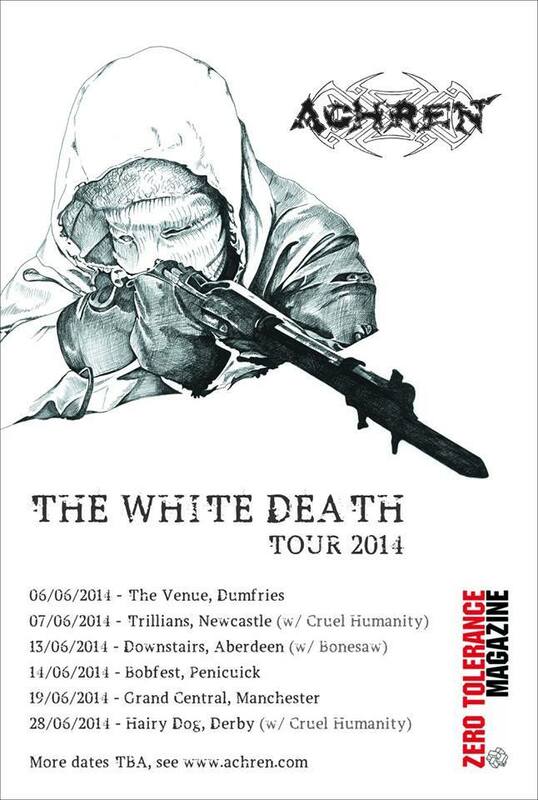 Achren will be promoting the new EP with some Zero Tolerance Magazine sponsored dates around the UK. The set will feature the entire White Death EP, along with selected album tracks and some completely new, unreleased tracks from the forthcoming second album. Achren will release an EP of new material on 7th April through Ceol Dorchas Productions. The 250 limited edition digipack CD release will feature three new tracks clocking in at just over 15 minutes in total. “The White Death”, inspired by the legendary Finnish WWII sniper, Simo Häyhä, was mixed and mastered by Matias Helle at Drophammer Studios, Helsinki and features Qball of Co-Exist and Bacchus Baracus on drums.